Discussion in 'Video Game and Fantasy Football Board' started by BPDaawg, Apr 8, 2015. JacobPalmer, AubCabs, Lucky24Seven and 3 others like this. Lucky24Seven, Swim Cantore and JacobPalmer like this. When you guys are tired of Swim you can join my clan full of Husks. We win a lot. anyone have a good TH10 base? war base? BrickTamland, Shiggityshwo, Fusiontegra and 2 others like this. Sorry team. Was built and just forgot. I, for one, believe in our Irish overlord and have full faith in him and his direction. View attachment 39855 Anyone want my account? Can you guys lower the trophy rating to 2k so I can join again pls. It's time for some procrastination. Swim Cantore and Lucky24Seven like this. There's a reason why some of us are opt'd out of wars. Who opted people in? I'll grab my pitchfork. You guys are always welcome to send an application to join mine. We're on a 9 win streak. slhorn, Shiggityshwo, Randy Bobandi and 1 other person like this. worth checking in again, anyone want my account? JacobPalmer and Randy Bobandi like this. Recently, an image leak that is allegedly for the next "Clash of Clans" major update suggests that players might soon be allowed to create a second village. Redditor SebixPhoenix has recently shared a link to an image that is believed to represent the next major update for the hit massively multiplayer online mobile game. Another Redditor, named MasterQNA, responded to the thread and translated the Chinese text found in the upper right side of the photo. MasterQNA said, "The big text on the top right means 'second village, night world of extreme speed' and the small text below means 'unprecedented huge update.'" The translation sparked speculations that the leaked image, if it is legitimate and accurate, hints at allowing players to create a second village in one account. Since the photo clearly shows a night setting, it was also easy for players and fans to guess that "Clash of Clans" might soon offer a Night Mode. As per the aforementioned translation, a game setup at night is also suggested. However, some players think that introducing the ability to create a second village under the same account is not much of a big deal, but others also argue that it might be worth it for veteran players who have already mastered the game and now have a very stable village. Meanwhile, another report by the Inquisitr suggests that the leak might also be hinting at the addition of ships for battles on bodies of water. 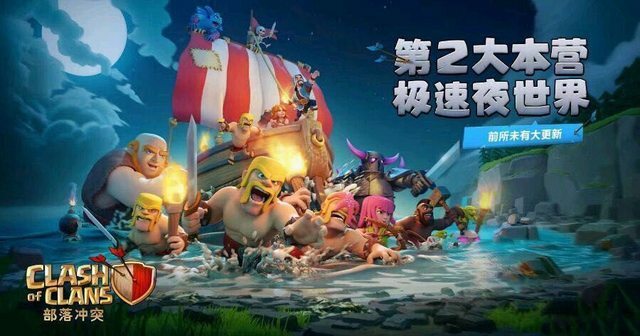 In the leaked photo from the same Reddit thread, characters can be seen working their way out of the water while a big ship is placed right behind them. In another leaked gameplay screenshot on Twitter, as posted by @SquadMythical, it is suggested that ships, called Shipyard, will also be added to the game. However, it is important to cautiously take these rumors with a pinch of salt since "Clash of Clans'" developer Supercell has not yet officially mentioned anything about the next update's contents. Very interesting. Fill my CC. Randy Bobandi and Shiggityshwo like this.